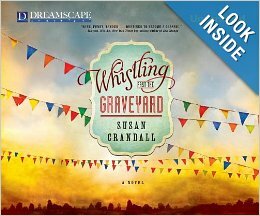 When I heard Amy’s interpretation of Whistling Past the Graveyard on the audiobook, I was blown away. Not only do I feel she did an outstanding job, the industry does also; she received the Golden Earphones Award for her work on this book. I just finished listening to Whistling Past the Graveyard. I didn’t know the Bitter Southerner had recommended it (I’m from Atlanta). I didn’t know anything. Just pulled it off the shelf at my local library. Thank you so much for such a glorious and important story. I loved it and am telling everyone to read it. I’m addicted to books on tape. I feel lost if I’m riding in my car without someone telling me a story! And I’m very picky about my readers. Amy Rubinate did a terrific job. Wonderful with the southernisms. It’s been a couple of days since I finished reading it. I’m on to the next book. But I really miss Starla and Eula. They are so strong. Thank you so much, Sue. Amy did do an amazing job with her narration. She even won an award for it! I truly appreciate you sharing WHISTLING PAST THE GRAVEYARD with your friends. I, too, miss Starla and Eula. I loved spending my days with them.